the road to town, originally uploaded by Mister Wind-Up Bird. Flashlights in hand, we walked through black hallways and common areas of our sprawling, four-story guesthouse. “Sorry, the generator is a little broken,” said one of the half-dozen staff gathered out front. It wasn’t too hard to see why fixing the generator might not be a priority: as far as we could determine, we were the only guests they had, and seemed to be two of what I’d generously estimate were around a dozen and a half Westerners in Nyaungshue. The tourist trail in Burma is clearly-marked but populated by a slow trickle of foreigners, which means you tend to spot the same people repeatedly. On the downside, an off-the-beaten-path place like Burma attracts the dregs of the backpacker circuit, sour-faced budget-travellers like The Nazi and The Troll, two backpackers with a penchant for Hitler-themed shirts and dubious hairstyles, or Le Squad Francaise, a group of we-are-the-hardest trust-fund hipsters who haggled over pennies and glared hatefully at every other foreigner. On the plus side, though, it threw us together with Uri and Chen, two incredibly nice, funny, well-traveled young Israeli professionals. We encountered them first at Yangon airport and ran into them again in Bagan, where we took shelter from a sudden windstorm at their table in one of the Burma’s many “I have no idea what the hell Westerners actually eat but I know they like cheap beer”-themed restaurants. We had a surreal reunion in Nyaungshue when we both cut down the same unlit side-street from opposite directions. In the dark, they look like any other couple, and we almost passed them by, but we have the distinction of being a pudgy 5’4″ dude holding hands with his 5’9″ wife. Even without streetlights, we’re easy to spot. 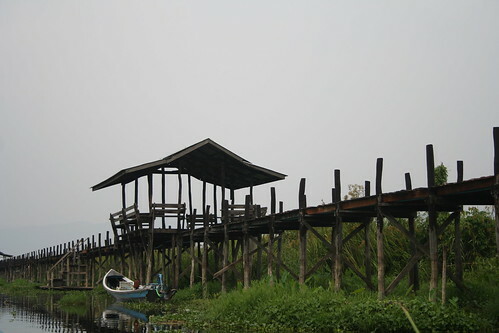 We chatted for a bit and decided to hire a boat to see the sites of Inle Lake together the next day. Which was spectacular: a real highlight of our travels so far. Seriously, it’s straight-up National Geographic out there. Inle is a smallish, shallow lake, though it would be hard to determine the exact size, as all around the edges, it transitions into huge expanses of reedy marshland—not dissimilar to many of the lakes in southern Saskatchewan, actually. Unlike Saskatchewan, though, the marsh is dotted with villages built out onto the lake. Entire towns are built up on stilts: houses, workshops, even bars all loom overhead as you go through on boats. The local people spend much of the day on little skiffs, which they paddle to get from place to place, and use as floating platforms for work. Going to the store? Paddle your skiff on over for some soap and a coke. Hanging the laundry? Take the skiff two meters and hang it over the water. A drink with your buddies? Tie up your skiff to the little rattan stilt-house with all the liquor ads taped to the walls (just don’t ask if they’re licensed). Not surprisingly, we saw everyone from toddlers to uniformed schoolgirls to fishermen to elderly women gracefully guiding their little boats along the regular gaps between rows of stilt houses that serve as roads. Intha fishermen, originally uploaded by Mister Wind-Up Bird. 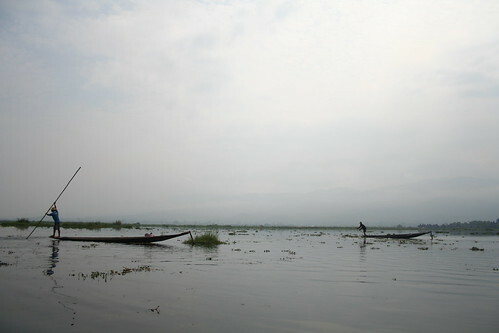 The Intha people of Inle Lake have also mastered an unusual leg-rowing technique, where they keep their hands free by tucking an oar under the arm and wrapping a leg around the oat to row. I can’t imagine mastering it, but we saw six-year-olds for whom it was as natural as walking. Of course, folks aren’t there just to be scenic—they’re making a living out there. The lake echoes with thundering slaps from the local fishermen, who catch fish by striking the water with huge poles and scooping the stunned fish up in nets. Even more unusual are the floating vegetable gardens: blocks of earth and seaweed suspended on the surface of the lake by long bamboo poles driven into the lake bed, planted with tomatoes and gourds. I found it kind of fascinating, actually. I’ve never heard of this style of agriculture, and I wonder if it’s unique to the region. So many questions! Does being on the lake protect from pests? Does the sun and water increase yields? Is lake seaweed a good fertilizer? Do the poles keep the gardens from sinking, or just from drifting in the currents? Where’s an aquaagronomist when you need one? Inle Lake is a pretty incredible place. More than Bagan, even, it was the real highlight of our Burma trip. And it was great to hang out with Uri and Chen! Jan and I are comfortably introverted people and don’t feel much need to party with 22-year-old backpackers or strike up conversations with middle-aged package tourists. But we hit it off quickly with these far more outgoing travellers, not too dissimilar from us in age or temperament. Like hanging out with Mark in Bangkok and Yangon, it brought us out of our little travel-couple bubble a bit which is probably not a bad thing from time to time. This was written by Eric, your haikuist. Posted on Wednesday, May 4, 2011, at 11:17 pm. Filed under adventures in asia. Tagged Burma, Inle Lake. Bookmark the permalink. Follow comments here with the RSS feed. Both comments and trackbacks are currently closed.